A softbox creates soft diffused light by directing light through diffusing material. You can soften the light even more by using the included additional white diffusor. 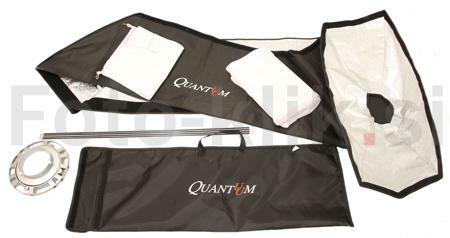 Quantuum softboxes are often easier to manage than umbrellas when it comes to controlling the amount of light that falls on the backdrop or background of an image. A softbox can be used with either flash or continuous light sources.